Going meta means going up one level. When you go meta, you act as if you’re an interested observer to the situation, and you comment from that observer position. Done on yourself, the purpose of going meta can be to get you to consider the effects of your actions. “Meta”, in one sense, means “self-referential”. In other words, looking at your own actions. Done with another person, it can get them to examine the implications of their actions. That can be useful in persuading, combating bullying, or therapy. And in changing the world. Going meta is one NLP/Ericksonian hypnosis technique among many, that change scope. When people are stuck, we can help them get unstuck by getting them to see other ways to look at a situation. 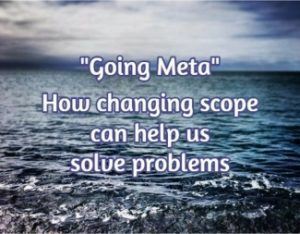 Going meta generally helps people take a broader perspective, which is often useful. As an example of how a broader scope might help, a person who wants to stop smoking may have tried several times and becasue of that, believe it’s impossible for them to stop permanently. Commenting that 1 million people a year stop smoking, and many of them had previously tried many times, gets them to consider their previous attempts as part of the process of successfully stopping. Saying that 1 million people have successfully done it, may help them see themselves as part of a bigger picture. Going meta is a bit of a traditional, “therapisty” thing to do. It’s not a technique I’d use in therapy or in life too often, but it’s powerful when the moment is right. And it relates to what we call “dissociation”, in NLP (dissociation means different things in other schools of thought). In NLP, dissociation simply refers to the idea of looking at something, but not from your own perspective. And we mean it in a descriptive sense. When you have a memory, for instance, you can remember it from your own perspective. You can see through your own eyes, in the memory. Or, you can ‘remember’ it as if there was a camera there, and you’re looking at it from the vantage point of the camera. Being associated (in the memory), tends to have more emotion. Being dissociated (watching from a different perspective), tends to produce more, well… perspective. And of course, there are lots of alternatives. You can look at things from the vantage point of another person. You can imagine you’re floating above the scene, or far away. Each perspective has different advantages. So, that’s the mechanical aspect of it. But what about the psychological and emotional aspects? The NLP Fast Phobia Cure, Time Lines and many other NLP patterns and techniques use dissociation. Dissociation helps lessen the emotional impact, so it’s a good step when you’re working with a painful or traumatic memory or imagined event. But today, I’m going to talk about another use for a particular type of dissociation. Let’s suppose your kid isn’t doing his homework. You might get angry and punish him, if you take one perspective — namely that he needs to get his homework done. If you “zoom out” and expand your perspective, you might think it’s more valuable for him to learn by making his own mistakes. Zoom out even further, and you might think that it’s more important to spend personal time with him, than finish the homework (you might not, too). Considered in geological time, compared to the life of the planet, the homework isn’t too important. It all depends. When we’re working with clients, or trying to change our own perspective on something, we might be looking for a frame of reference that helps us reach a particular goal. We might zoom in or out, looking for that viewpoint that motivates or inspires. Going meta is one particular type of zooming out, which gets us to consider our own behavior. We might imagine we’re looking at ourself getting angry, and punishing our kid for not doing his homework. We can observe both ourselves, and our kid. We might ask ourselves, “What long-term effect will this behavior have on my child?” If we’re able to stay dissociated and out of the emotion, we might come up with a better behavior, that has a better long-term outcome (or, we might not). We can do this mechanically, by asking our clients, or ourselves to view things from a different perspectives, motivations, or in relation to different expanses of time. Or, we can use language to expand scope. What do you hope to accomplish by doing/saying that? What does that behavior get you? These are all questions that, if considered, will cause a person to expand their scope, in one way or another. They may go meta in considering the answers to the questions. If you add dissociate language, you’ll increase the chances of them going meta as they widen the scope.